I have so far this year managed to grow a lot of coriander, dill and parsley, so for the first time ever I can make a variation of an Ottolenghi recipe (from Plenty) that features a lot of herbs. Yes I know shops sell herbs, but I don’t like to buy things like food – especially herbs that in theory I should be able to grow myself. Yes, I am freakishly weird like that. 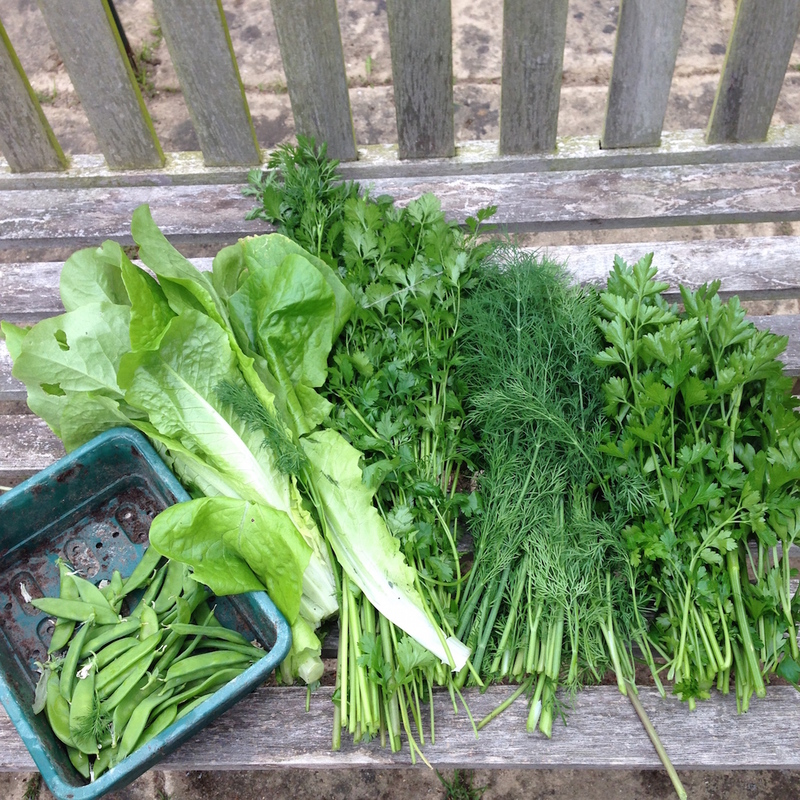 Bunches and bunches of herbs and the first mangetout of the season – yay for growing food. 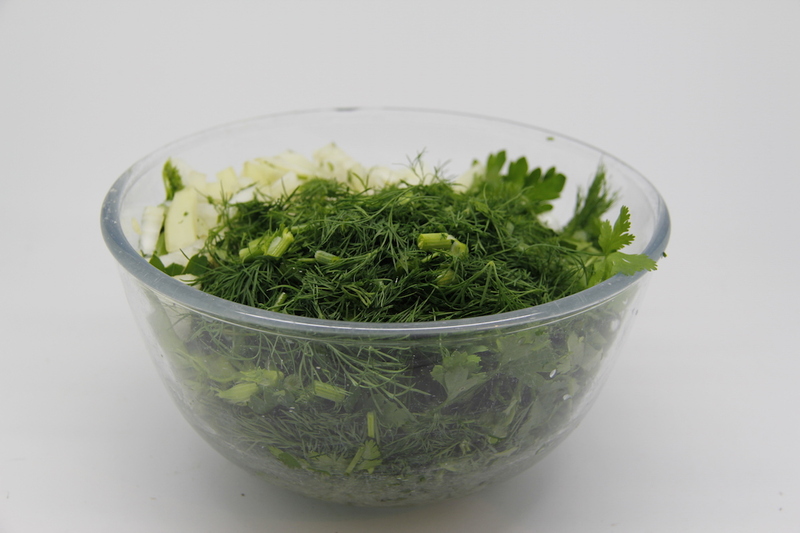 Ingredients: white basmati rice (I think it said 200g, but this is too much – I would go with 100g or 150g – it depends how much you want as leftovers for lunch that week and whether you want to give some to your dogs as well), big handfuls of dill, parsley and coriander, half a diced onion – you could use (and indeed Ottolenghi’s recipe asks for) spring onions, but mine aren’t ready yet, one potato, salt and some oil. Rinse the rice and leave to soak in quite a bit of water for hours (I didn’t do this as I didn’t have enough time – maybe I left it for 45 minutes). Finely chop the herbs and onion. Add some more water to the rice and its soaking water. Add some salt and all the herbs as well then bring to the boil. Cook just for a few minutes – so it still has some bite – possibly I cooked mine for too long as I got distracted (story of my life). Drain the rice and herbs. 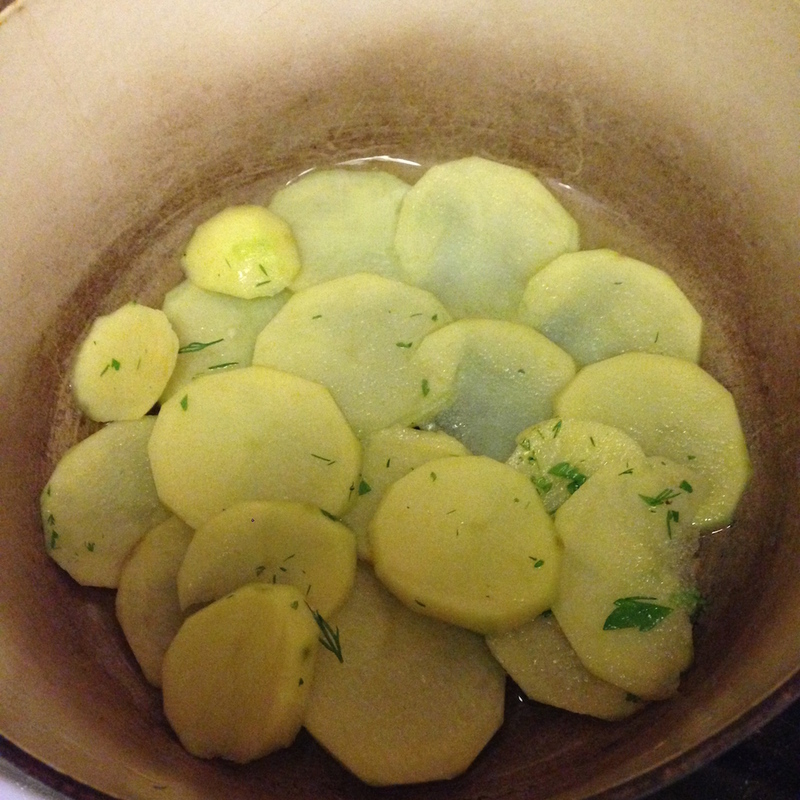 Slice the potato very thinly and cook gently in some oil in a thick based saucepan. 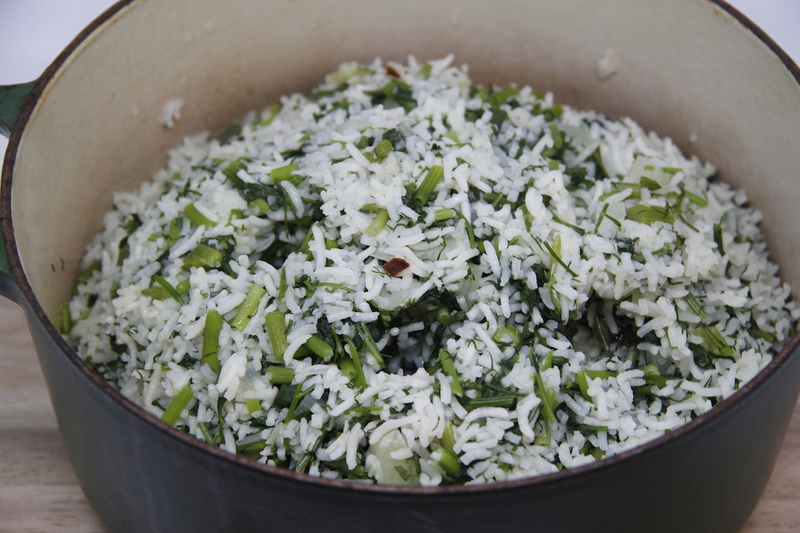 Then pile in the herb and rice mix. Try not to let it touch the edges – make a pyramid. Then make 5 holes in the rice pile with the handle of a wooden spoon. Add 1 tbs of water and one of oil. Put the lid on. Cook on a hot hob for a minute, turn down to its lowest setting for 20 minutes, then remove from the hob and leave it for another 20 minutes. It is now ready to serve. We had it with speedy lamb kofte in a tomato sauce – will have to blog about that later as I forgot to take photos – and yoghurt. I then ate it with yoghurt and lime pickle for lunch for days and days.